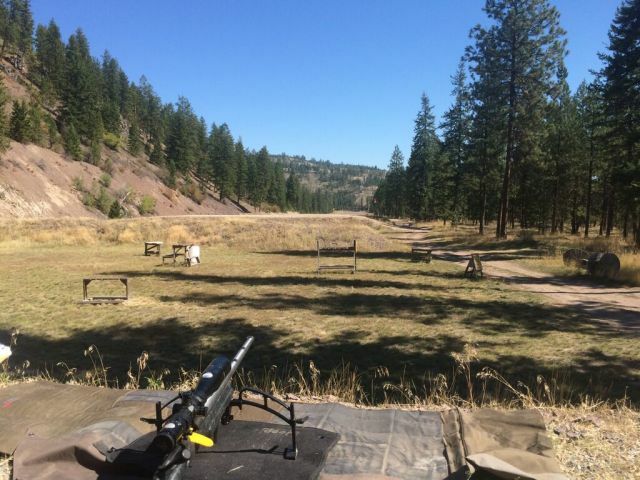 Here is a write-up from Accurateshooter.com of the sling and F-class shooting during the Northern Rockies Long Range Tournaments conducted at the Deep Creek Range near Missoula, Montana in September 2015. After my previous post, Montana Elk Hunting Update, reader John G. sent an email asking what I was shooting (when I achieved High Master). These days I shoot two different rifles. One is a AR15 "space gun," and the other is a Tubb 2000. I interchange both rifles in Across-the-Course and prone events, but shoot the space gun more in Across-the-Course and the Tubb gun more in prone. There is a trade off between the two. In rapid fire you don't have to work the bolt between shots with the gas gun, but the trigger is much heavier and slower than the Tubb. The Tubb gun has a much lighter, faster trigger and has a superior cartridge for the 600 yard stage of the Across-the-Course matches. AR15 Space Gun. .223 caliber and 6mm Fat Rat. I actually have two duplicate AR15 space guns. One in .223 Remington and one in 6mm Fat Rat. Shooting the 223 is much cheaper and is easier on barrels than the Fat Rat--although the Fat Rat isn't that hard on them--so I practice and shoot some reduced distance matches with the 223 and save the Fat Rat for full distance matches. A 6mm Fat Rat is basically a 6.5 Grendel necked down to 6mm. Safely loaded, the Fat Rat, in my rifle, pushes the 105-107 grain bullets from 2700 to 2800 fps. Tubb 2000 or T2K. 6mmXC caliber. My Tubb gun is in 6mm XC caliber. Basically its an improved 6mm-250. When I first started shooting it, I tried to squeeze every fps out of the cartridge with bad results. Shooting the 115 grain DTAC or 115 grain Berger at 3000 fps + produced great extreme spreads and impressive groups, however, when Montana's temperature went from 60-70 degrees to 100+ a few bullets blew up never making it to the target. Now days I play it safe. Most of my loads in the 6XC are around 2850 or 2900 fps. Left to Right: 22LR, 223 Remington, 22 BR, 22-250, 6mm Fat Rat, 6mm AR Turbo 40 Improved, 6mm XC, 7mm-08, 30-06 Springfield, 300 Winchester Magnum. During the last decade many different rifles and cartridges have won the national matches. Carl Bernosky shoots a space gun in 6mm Hagar. A while back Sherri Gallagher won shooting a Tubb gun in 260 Remington. Several shooters have won shooting Tubb guns in 6XC, and last year (2014) Joe Hendricks won shooting a Tube (not Tubb) gun in 6CM (Competition Match). It seems to matter less "what" a person shoots than "how" a person shoots it. Essentially, "Kin Ya Shoot That Thar Thang, ur Kin Ya Not Shoot That Thar Thang?" Very little has been added to Montana Elk Hunting over the past two years. Work and life have had me pursuing things instead of sitting at the computer writing about them. I recently quit my job. A job that was the most stressful and least thankful job I've every had. It paid the bills, but that was all. Simply sapped my energy for only a pay check. I thank God I finally had the balls to say, "Enough is Enough." So, I am looking for more engaging employment and will have time to make additions to this blog. Over the years many have emailed me to continue and so I will continue. At the top are some static pages: About (both about the blog and the author), a Sinclair Store (if approved by Sinclair), Product Reviews and Book Reviews. All of them are under construction and will be added to as time permits. On the home front I have some personal accomplishment to share. 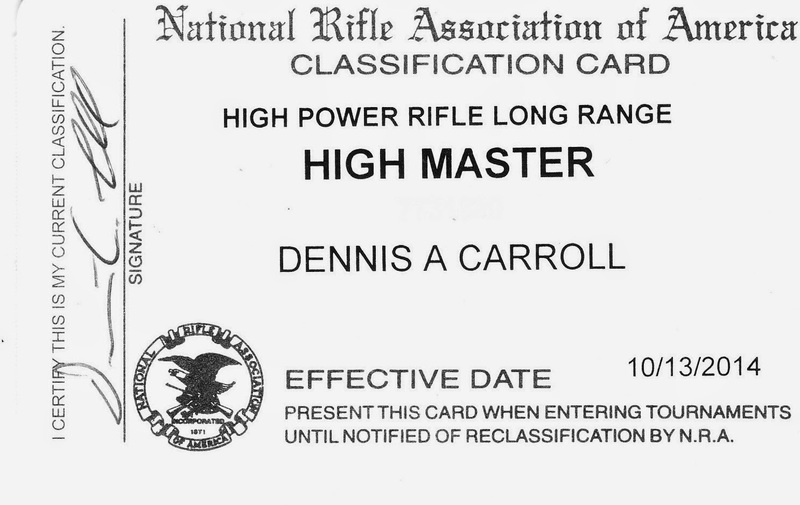 During the past summer's High Power shooting season, I made High Master in three disciplines: High Power (Across the Course--200 yard offhand, 200 yard rapid fire, 300 yard rapid fire, and 600 yard slow fire), High Power Long Range Rifle (All slow fire prone at 800, 900 and 1000 yards), and High Power Mid-Range Prone (All slow fire prone at 600 yards). Mid Range can be shot at 300 and 500 yards, but in my case, I never shot a Mid Range Prone match at those distances. Below are my new classification cards. 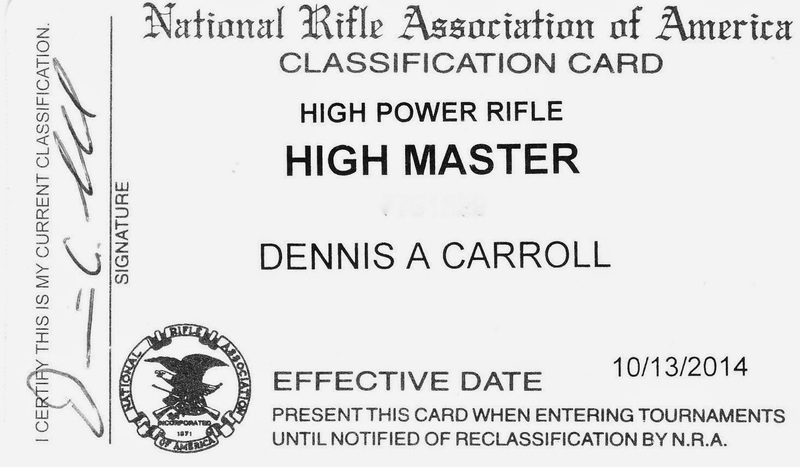 To make High Master in NRA Competition a competitor must fire a score of 97% over 240 rounds. The normal course of fire is 80 shots with a perfect score of 800. So, 97% would be 776. 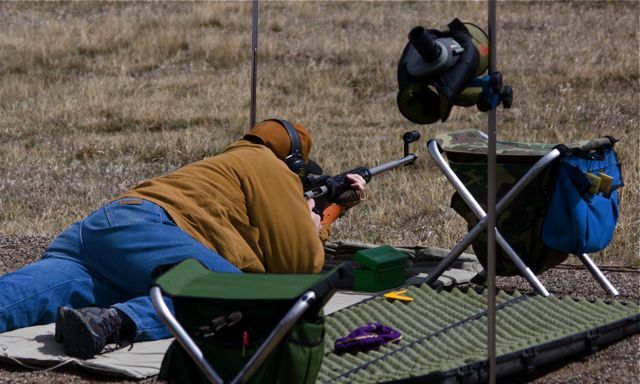 To make High Master in NRA Long Range Rifle competition a competitor must score 97% over 240 rounds. A normal course of fire would be 15 or 20 rounds with a perfect score of 150 or 200, respectively. So, 146 or 194, respectively would be a High Master score. 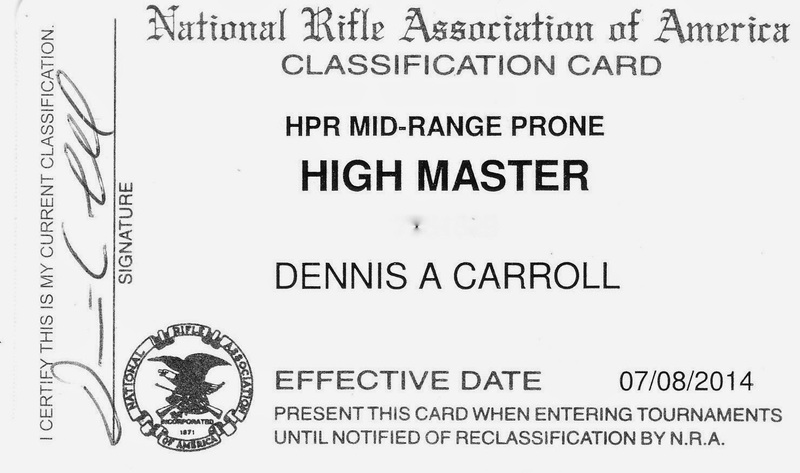 To make High Master in NRA Mid Range Prone competition a competitor must score 98.5% over 240 rounds. A normal course of fire is 20 rounds with a perfect score of 200. A High Master score would be 197. For perspective, the 10 ring at 600 yards is 12 inches in diameter and the 9 ring is 18 inches. A competitor could shoot 3 nines and 17 tens to make High Master in Mid Range. To be clear, while making High Master isn't "the" beginning, it is definitely "a" beginning. Shooting 97 or 98.5 percent is not competitive at the national level. None the less, it is a level achieved only by practice, practice and more practice. And, personally was much more difficult than achieving my Distinguished Rifleman's Badge. Good Luck in Your Shooting, Your Hunting and in Your Life. Great video from SAAMI, the Sporting Arms and Ammunition Manufacturer's Institute. If you are a hunter, shooter, fire fighter or just someone interested in how sporting ammunition reacts to being dropped from great heights, shot by highpower bullets, or burnt in various scenarios you've got to see this! I caught the video at accurateshooter.com. Marian's Hunting Stories, etc., etc., etc. Google uses third-party advertising companies to serve ads when you visit this website. These companies may use information (not including your name, address, email address, or telephone number) about your visits to this and other websites in order to provide advertisements about goods and services of interest to you. If you would like more information about this practice and to know your choices about not having this information used by these companies, click here.